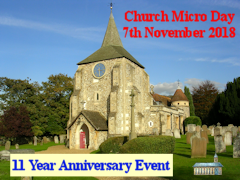 This is celebrated on the anniversary of the publication of the first cache in the series, Church Micro 1...Earlswood, on 7th November 2007. 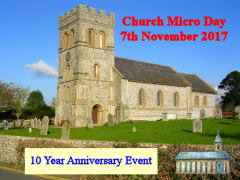 From the 5th anniversay statistics have been produced for all Church Micro finds on the anniversary day. 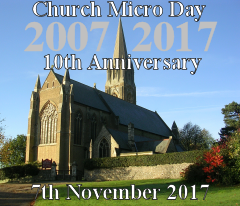 From the 10th anniversary statistics have been produced for all Church Micro events held relating to the anniversary day. Note: not all events are held on the 7th November, a few are held within a few days either side. The below table lists all available anniversary statistics. 2018 statistics: First produced on 12/11/2018. To be finalised on 10/12/2018. Please ensure your logging is up to date! Note: All links in the below table open in a new window / tab. Our thanks to Sean of the Flookfinders for the above artwork. Just for the record, there have been some unofficial souvenirs. 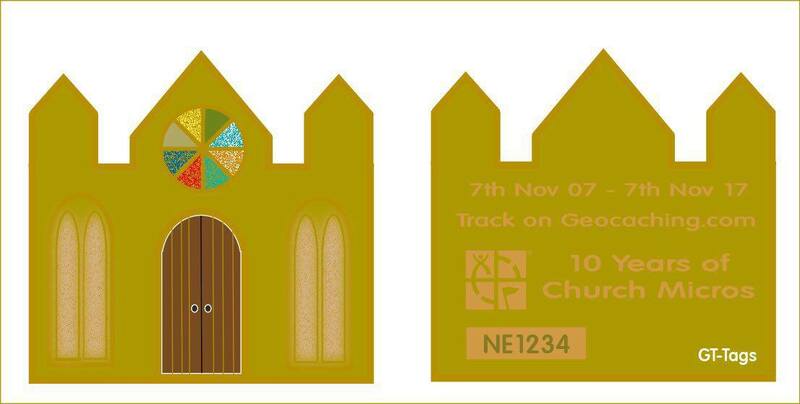 I wanted to announce the production of an anniversary CM geocoin being produced with the assistance of NEGeocachingSupplies.com. Unfortunately there has been a delay with the manufacturing process but we are hoping they will be available for the 7th November but this is not guaranteed. An initial order of 200 coins has been made with a possibility of more if demand dictates. I am still awaiting the Final final proof from the manufacturers but the image they are working from is below. I took some advice from Trevorsilk and based it on a Minister style. Believe the coins will be approximately 38mm along the bottom edge. Please DO NOT reply to this post as the wife already spends her life on here and will loose the 1001 conversations she is already involved in. Please email cmgeocoins@btinternet.com. Once I know the exact delivery date I will post an update, if they do arrive prior to the 7th (fingers crossed) the priority will be to event organisers and then general release.